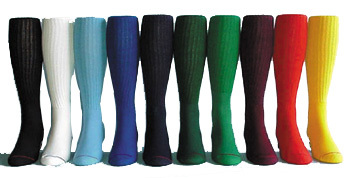 All stock socks are made from a hard wearing and comfortable acrylic, nylon and elastic blend to ensure a lightweight, colorfast material. They stay up, even around rugby calves, without the need for circulation stopping tie-ups. Fits adult shoe size 9 1/2 - 13.